"The New Library" in Nottingham Guardian 15.11.1938; Photograph of the library building after it was opened. On the 15th March 2013 the new £5.3m West Bridgford Library and Young People’s Centre was opened, welcoming over 22 thousand visitors in just the first two weeks. 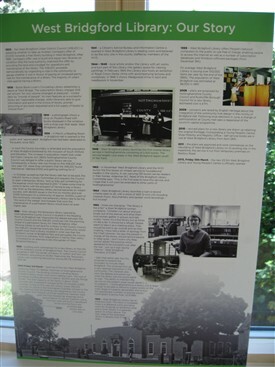 To map the progress of the Library from its beginnings to its current place in the community, the gallery opened with a local history exhibition about West Bridgford Library itself. The WBUDC is debating whether to take up Andrew Carnegie’s offer of £3,000 towards a free library building in West Bridgford. After 1889 Carnegie’s offer was to build and equip new libraries on condition that the local authority matched this offer by providing the land and a budget for operations and maintenance of the library. 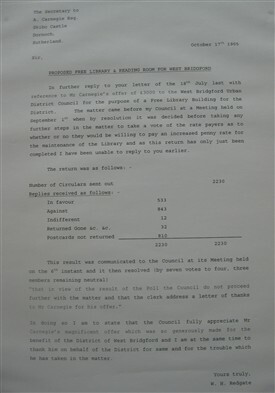 In this situation the WBUDC proceeded democratically by organising a vote in the community to gauge whether it was in favour of paying an increased penny rate for the maintenance of a library. This letter is the WBUDC’s reply to Andrew Carnegie and shows that the majority of voters voted against having a library. 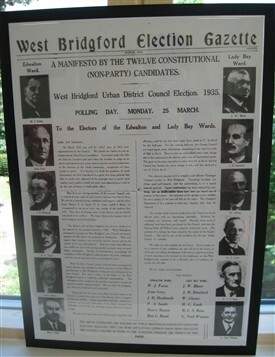 The concerns and priorities of West Bridgford’s citizens at the time are reflected in the election gazette of the WBUDC. At this time Boots Book-Lover’s Circulating Library had established a depot at Trent Bridge. It was a subscription library charging 10/6 per annum “for one volume (changed at pleasure)” and supplied books for readers in West Bridgford. 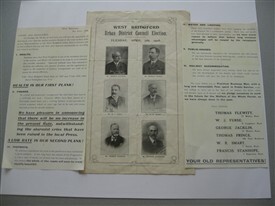 The advertisement was printed in the St Giles’ Parish Bazaar, 1908. 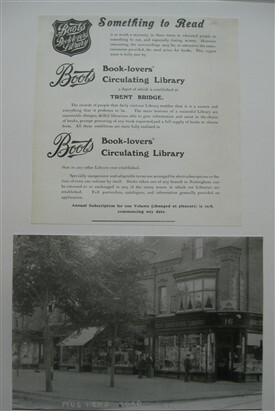 A photograph shows a shop on Musters Road with books displayed in the windows having a shop-sign that reads ‘West Bridgford Library’. This is the first public mention of a discussion about a new library for West Bridgford. Significantly it is referred to as “one of the problems for the new Urban Council to consider”. 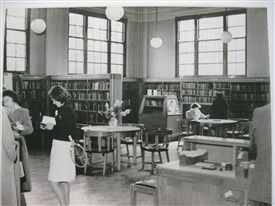 The only service of this kind available in West Bridgford was a Reading Room in Bridgford Hall, which was opened to the public in October 1928. The WBUDC minutes from 8 December 1928 record a lukewarm reception of the reading room. "Captain W.H. Belton said that the idea of the reading room originated with some people of leisure. There was no real call for a reading room in Bridgford, and the same remark applied to a library. There was no desire on the part of the people to spend their evenings going to a reading room." Bridgford Hall had been dedicated to the public since 1923. – Temporary library service in West Bridgford - in October, accepting that the library rate had to be paid, the WBUDC forms a Library Committee and requests the Council to open a temporary library, “and so they got something for the expense which had reached £1,200.” It took some time to come to terms with the prospect of having to pay a library rate. Even as the temporary library service became an instant success, with 48,000 issues in the first six months and over 3,000 borrowers (in a community of approx. 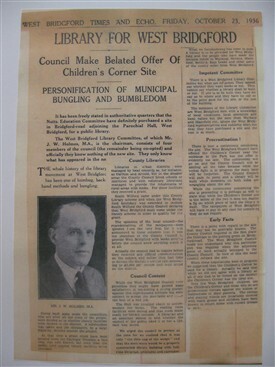 21,000), a part of the community considered the temporary library rate to be the “thin end of the wedge”. – from January the temporary library opened by Nottinghamshire County Council was located in the Reading Room at Bridgford Hall. Meanwhile the debate between the County Council and the BUDC continued into the planning phase of a permanent library for West Bridgford. Follow the debate in the newspapers of the time in the West Bridgford Library Scrap- and Newscuttings Book 1936-1964, which was compiled by a West Bridgford resident with an eager interest in the library. 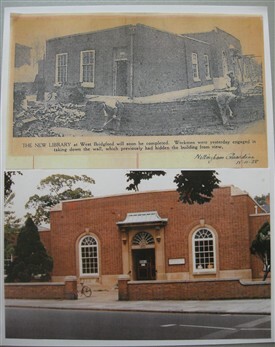 The book contains articles published in local newspapers about West Bridgford Library, and is available in the library’s Reference collection: L02.1 West Bridgford. 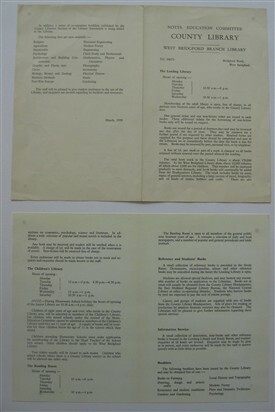 Two facsimile copies are also available for Reference. Building work commences for the new library on the site of the children’s corner of Bridgford Park. The County Council accepted in 1937 the tender of Messrs. R. Hofton and Son, Ltd., of Beeston, amounting to £6,183. Meanwhile the temporary library was sustaining demand by issuing 96,718 volumes in 1938-39. “The New Library” in Nottingham Guardian 15.11.1938 Photograph of the library building after it was opened. Photograph of the opening of West Bridgford Library on Friday 3rd March 1939. The library was opened by Major T.P. 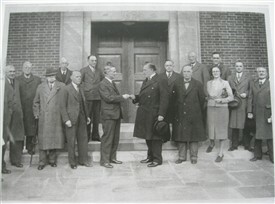 Barber, Chairman of Nottinghamshire County Council, shown here receiving the key from Principal H.A.S Wortley who chaired the County Library Minor Sub-Committee. 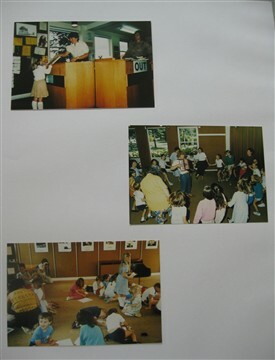 The building contained a lending library, children’s library, study room and a reading room. The cost of the library building amounted to approx. £6,200 and the fittings £1,045. The shelf capacity of the library was about 7,000 volumes with a basement storage facility for another 6,000 volumes. During its first year the library issued 236,434 volumes. An article in the Nottingham Guardian printed on the day mentions that the building was designed by the County Architect E.W. 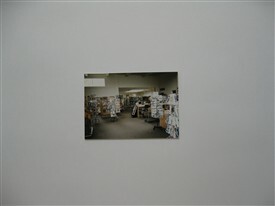 Roberts, and that traditional materials were used. The front façade has dressings and a centre feature of natural Clipsham stone, the main walls built in sandfaced bricks and the floors polished teak blocks laid on concrete. 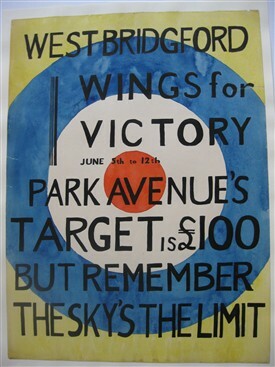 West Bridgford’s residents took part in these events during WWII. 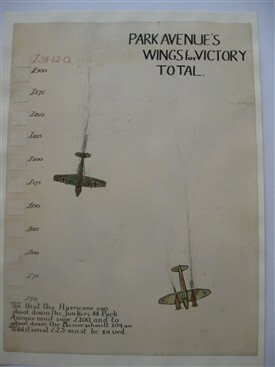 The original artwork poster for ‘Wings for Victory’ Week shows a particularly enthusiastic participant. 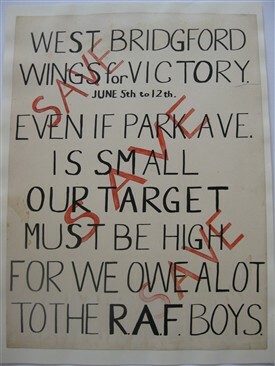 'Wings For Victory' Week and ‘Salute the Solider’ Week were fund raising schemes involving parades and exhibitions to encourage civilians to save their money in Government accounts, such as War Bonds, Savings Bonds, Defence Bonds and Savings Certificates. Cash would be paid into Post Offices or Banks. The ‘Salute the Soldier’ poster the entry for Thursday 25th May advertises a ‘Bring and Buy’ Sale organised by the W.V.S. to be held in the Reading Room of the library. 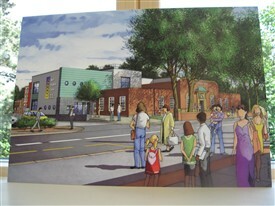 Local artists endow the library with art works and turn part of the library into gallery space for viewing paintings. 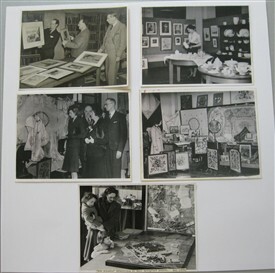 In February 1945 the library also hosted an exhibition of Royal Crown Derby china with accompanying lectures and workshops. In 1946 the library gallery showed Wedgwood china in April and needlework in November. The needlework exhibition was curated by the West Bridgford Arts Council and officially opened by Lady Margaret Cavendish-Bentinck (left). 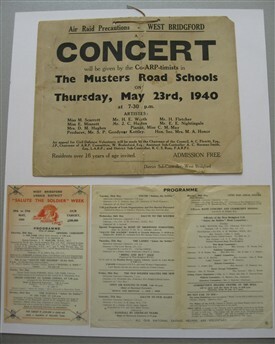 In May 1946 the library hosted an exhibition of models for schools of the future. 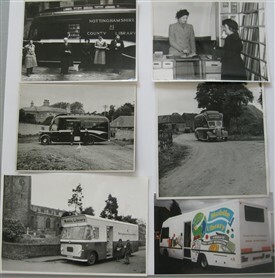 In 1949 West Bridgford Library launched the first mobile library service in Nottinghamshire on 22.12.1949. The service targets rural areas in the West Bridgford region south of the Trent. Alderman Holland is officiating the opening (top left). The first book is borrowed on the Mobile Library from a collection consisting of 2,500 books (top right). 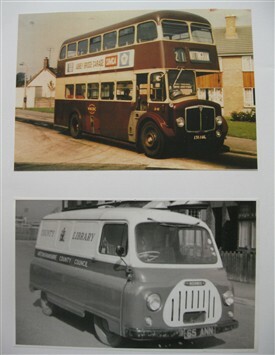 Photograph of the Mobile Library, 1972 and Photograph of the Mobile Library, 1996 Article published in the West Bridgford and Clifton Standard, 23.08.1963 Reading is all the rage in West Bridgford with demand for books on the rise. 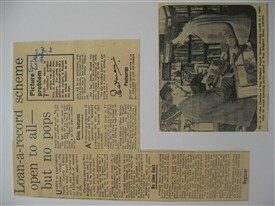 In November 1963 West Bridgford Library and the W.V.S. launch the first books on wheels service in the county an extended service to include housebound readers. Alderman B.C. 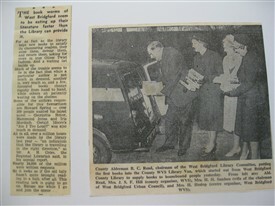 Read of the Bridgford Library Committee said: “This is the first area to have this service, and I hope that it will soon be extended to other parts of Nottinghamshire.” Article published in the Guardian Journal, 7.11.1963 Photographs of WBUDC bus and the library’s internal delivery van, 1960 The modern look of the WBUDC bus is well matched by the library’s own delivery van design. West Bridgford Library launches a loan-a-record scheme open to all, with a stock of 400 12-inch LPs including classical music, documentary and spoken word recordings – but no pop. 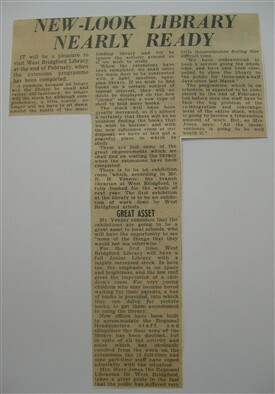 Article published in the Evening Post and News, 28.11.1964 Photograph (right) published in The Guardian Journal, 29.11.1964 This article flags up the need to modernise and extend the building to accommodate social change. Article published in West Bridgford Standard, 27.3.1965 D.H. Lawrence, whose books are shown on display for an exhibition in March 1960, was tried for obscenity and found not guilty in November 1960. West Bridgford Library has an extension built in, 1969 The stock is increased, there is a reference room providing room for studying, an exhibition area and a junior library in a separate space on a floor above. The floor area of the extended library is double what it had been. Article published in West Bridgford and Clifton Standard, 18.01.1969 Promotional poster for the Local Studies collection of West Bridgford Library The purpose of our Local Studies service is to be the memory bank of the local community – to discover, share, safeguard, and celebrate local stories. 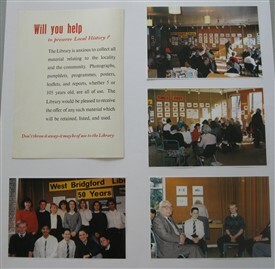 Photographs of the celebration of 50 years since West Bridgford Library opened, 1989 A group of 3rd year pupils from the Rushcliffe Comprehensive School visited West Bridgford Library as part of their Book Week/History course. 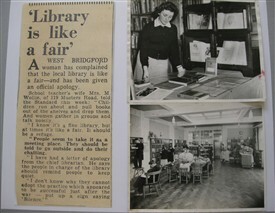 The purpose of the visit was to interview residents of West Bridgford who lived in the area in 1939 when the library was built. The session was well-attended by local people who came to meet the students and reminisce among the displays of history materials. 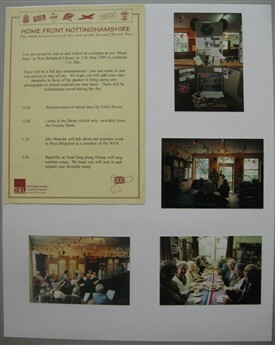 Advertisement poster and photographs from the celebration of the 50th anniversary of the end of the Second World War, 1995 West Bridgford Library was the place to celebrate and remember V.E. Day. 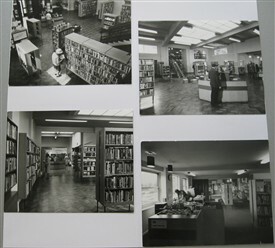 Photograph of West Bridgford Library, 1990s On average West Bridgford Library issued over 510,000 items per year by the end of the 1990s. The population of West Bridgford was estimated at 38,010 in 1997. 2008 - building plans are proposed by Nottinghamshire County Council and Rushcliffe Borough Council for a new library as part of a community hub. This would be a onestop-shop and bring together library, young people’s services, adult social care and health, benefits and advice bureau and registrars’ services under one roof. The estimated cost is £7m. 2009 – concerns are raised by English Heritage about the integration of the community hub design in the vicinity of Bridgford Hall. Altered plans for a new library were then submitted, which offered a two-storey building with meeting rooms and a council customer service centre. In response to English Heritage the new design made use of traditional materials for the building. Following local elections in May however, a change of administration at County Hall saw a reappraisal of the council’s capital programme and the plans were cancelled. Building plans proposed by Nottinghamshire County Council and Young People’s Centre, 2010 New plans for a library are drawn up in 2010, incorporating a Young People’s Centre, Shop Mobility and Registry Office. In a departure from the previous design the library is retaining the original frontage. The estimated cost is now £5.3m. 2011 - work commences on the rebuilding of West Bridgford Library on its existing site. In the meantime, the service is run from temporary premises on Rectory Road. The new library opened on 16th March 2013. This page was added by Betty Rose on 24/02/2014.